eaw026063 ENGLAND (1949). The Lune Mills and the town, Lancaster, from the west, 1949. This image was marked by Aerofilms Ltd for photo editing. 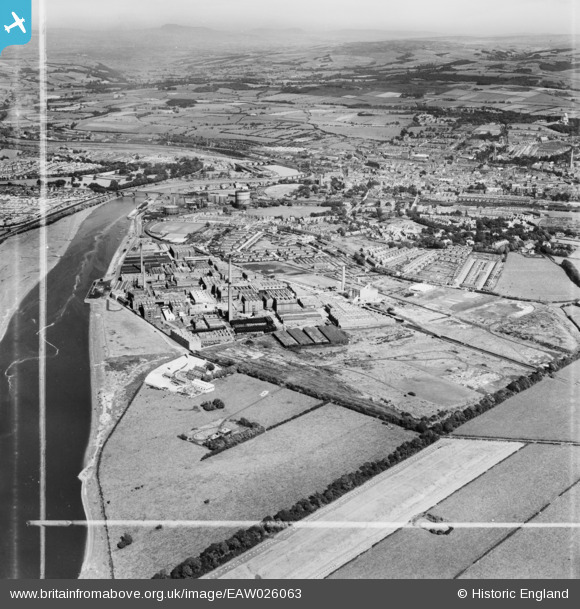 Title [EAW026063] The Lune Mills and the town, Lancaster, from the west, 1949. This image was marked by Aerofilms Ltd for photo editing. The Old Customs House, now a Maritime Museum. Giant Axe football pitch, the home of Lancaster City Football Club since 1911. (line of) Lancaster Canal, Preston to Kendal. Lancaster Gas Works taken over by Tommy and Len Grubb as a salvage yard, now derelict. Greyhound Bridge, now three lane car park, errr road bridge.